En Passant was released in 2000 by Frederic Malle, who opened his fragrance house, Editions de Parfums, in Paris that same year. En Passant was created by Olivia Giacobetti, one of the 7 perfumers originally given carte blanche by Malle to create whatever fragrance they wanted. According to Chandler Burr, En Passant "was born in the instant that Giacobetti somewhere on a street in her native Italy passed a bakery and a florist and got pastry, flowers, and street all at once". The notes are white lilac, watery notes, orange tree leaves, cucumber, and wheat. En Passant starts with sweet, lush lilac, but that stage does not last long; after that, it smells like lilac blossoms floating in water next to a loaf of bread. It is light and fresh, with green notes and a hint of cucumber, although it smells nothing like the cucumber-scented body products you might find at the mall. The wheat notes intensify as it dries down, but it is otherwise linear. It is a brilliant composition, but also a pretty scent, and very wearable. En Passant was one of the first perfumes that inspired me to find out who actually created it, and to follow the work of a nose rather than a perfume house. Frederic Malle En Passant is available in 10ml, 50ml, and 100ml sprays, as well as in body lotion. For purchasing information, see the listing for Frederic Malle under Perfume Houses. Note: top right image is Deep Lilac [cropped] by Michelle Kroll at flickr; some rights reserved. I love this one. Normally I don't like aqueous florals. However, in the case of Passant, the watery note balances the heady quality of the lilac. While this is a linear soliflore, I don't find it boring. I see a full bottle in my future! Thanks for your description, delightful as always. I like Giacobetti's scents for l'Artisan, so I'm intrigued. I have a sample of l'Eau d'Hiver and would LOVE to try more of the FM line, but I baulk at £50+ for the tester pack. I have another problem with FM – I like the packaging to make me feel that I'm buying quality, and I just don't get turned on by those plain bottles with cheap-looking paper labels. (Not that a cute bottle is anything to go by…the word 'Curious' springs to mind…and after all I've just bought Gobin Daude Sous le Buis, which cost £58 for 50ml, and the packing is AWFUL, although the juice sublime). Enough wittering! Question – what wearing conditions would you recommend for EP? Hello R! Thanks for the review – fantastique. I got tired of all FMs and you know I am fair (mostly). I wish that these would make me say “Wow” – never has and I doubt it will. Then again I never say never blahblahblah…. Guess I do not care for the pretentious ways the SAs (at least in Paris) like to insist that some fragrance will suit one person etc – come on we are all beyond that marketing tactic aren't we? I tried the newest L'Artisan today and it will be a grand success. It is pretty. To be fair I do like Brigarade Concentree (as a pick me up room freshner) – don't hit me! Good luck with your discovery – hope FM enchants you. I love it too, obviously! And I don't usually like Lilac. I have been swapping for the 5 ml minis, and luckily have quite a few now so I won't need to spring for the big bottle for awhile. Hi VanillaGirl, my name is Robin, and I actually just added that to the “about” section above. I hope to add a bit more biographical information when I get some time. I agree wholeheartedly with Parislondres…try to score some of the free samples by filling out the questionnaire on the editionsdeparfums website. Let them know maybe that you already have Hiver. On the packaging: I appreciate what Malle is trying to do in terms of not having “the filter of a brand”, and I also appreciate not paying “extra” for a beautiful bottle, but I do sympathize with you as well. Beautiful bottles are nicer to look at! All the same, if I could buy all my fragrances in plain packaging for less money, I'd do it in an instant. En Passant is probably a daytime, spring-summer fragrance, although I'm not good at following those kinds of rules — I do like it in the winter when I miss the smell of spring flowers. I can see both sides to this N. On the one hand, it is a lot of money for samples, especially if you can get them for free. On the other hand, they aren't really samples, they are minis, and so many companies don't make it possible to try their fragrances without flying to Paris and buying full-sized. N, I know you are jaded about FM! Which new L'Artisan, Extrait de Songes?? Please tell more!!!! I am expecting a sample this week. I'm not going to hit you, but Jean Claude Ellena might! Actually, that is one of the few JCE scents that doesn't work for me at all. Yes I tried L'Artisan Extrait de Songes today – beautiful on me I am pleased to announce. A gorgeous spring baby – I get lovely orange blossoms, mint, rose, sandalwood – I think it is a gorgeous creation of Olivia G. I may buy this. Oops – it is Extrait de Songe – the bottle is lovely – a blue-purple bottle. Thanks N, can't wait until my sample arrives! Hope you enjoy it too. Please let me know your thoughts – I look forward to another fantastique review. Supposed to be a limited edition which would be a pity. I initially liked En Passant then that wheat note got to me. I am really excited about Extrait de Songe, that is definitely on my sniff/buy list! Have you tried the Eau de Printemps yet? I hear it's a special edition L'AP for the Printemps beauty store. I heard the Eau de Printemps was powdery, so I didn't add it to my “go through hoops to get a sample” list, but I haven't seen any real reviews online yet other than a brief mention on basenotes. Have you heard about the new line they are supposedly going to add later this year: scents released in the same manner as vintage wines, such as this jasmine harvest from this year and this location? Apparently to be more expensive than the regular line. Great review of my absolute favorite perfumer. Most Malles work for me, with the exception of Parfum Therese. I have tried En Pessant, and think it would be lovely for springtime. If I had my wish of owing an entire collection of anyone's fragrances, it would be all the Malles indeed. I would either get used to, or give away the Perume Therese. So far, the Musc Ravengeur and the L'Eau d'Hiver are my favorites, with Iris Poudre running third. Barbara, You could give the Therese to me, LOL — it is one of my favorites! In my hometown (in Germany) my perfumery just started Frederic Malle's Ed.de Parf!! They have all the scents, only in 50ml, though. Had a chance to try them all. They recommended En Passant for me, but it developed quite an unpleasant undertone (reminds me of Naphthalene)on my skin(less predominant on the paper).What ingredient might cause this? There are rumours about Mr. Malle himself visiting soon…I made the owner PROMISE to tell me if he really does. Lucky you, it is a wonderful line! If you meet Mr. Malle, ask what is coming out later this year. There are rumors of a tuberose scent, and also rumors of a leather scent by Olivia Giacobetti. No idea what smells like Napthalene, but some people object to the cucumber note in En Passant. I am devastated. I tried Therese yesterday on my skin and it was just unwearable. Chanel No. 5 does the same thing when it comes in contact with my chemistry: it goes all strong and sour and ugly. Must be the aldehydes? Thanks for helping me sort out what I'm responding to, R. I feel that my nose is becoming more and more able to “understand” fragrances, giving me access to clearer impressions, both subjective and objective. It's such a great new awareness! You've helped me a lot. This isn't an educational site, per se, but I find it more helpful to me than anything else, and I am a devoted follower. You know, I'm really understanding JCE and Olivia G., for example, much more. I'm purchasing En Passant when Frederic Malle himself is in Vancouver in November, and I look forward to learning from him. What an amazing subject fragrance is!!! Sigh. Monsieur Malle was surrounded by drop-in rubberneckers at the noon hour and he ignored the pair of devoted fans (myself and a lovely French woman) who had had our 1:00pm audience with him booked weeks in advance. I finally had to leave to get back to work. Quelle disappointment!!!!! Oh, well, the fragrances didn't smell any less wonderful for that. Wow, are you saying you had an appt and he didn't even talk to you??? That is seriously rude, I'm so sorry! I have always heard he is so charming, but that is not charming. He was, indeed, charming. When I finally ran out of time, forty minutes after our scheduled meeting, I got up from the couch were he was to hold court, walked over to the fragrance counter, politely broke into the conversation he was having with a non-appointmentee, and said that I was very sorry to have to leave and not hear him speak, but that I was a working girl and my lunchtime was over. “Ah, and I am a working boy,” he smiled apologetically, with a gaellic shrug at the women around him. I did get to hurriedly express my admiration for his line and his perfumers, and he thanked me graciously and seemed a little sorry about the situation. It's really my disappointment; I'd read up on him, had my cute opening line all ready (“so, you like first-growth Paullacs and the Rolling Stones? Verrrry interesting!”), was like a wrung-out sponge ready to absorb all his worldly words. . .He was gorgeously dressed and had beautiful eyes and a warm smile. Next time I will take the day off work!! Sorry, R., fumble-fingered typo. Pauillacs! Ah, well, I'm glad he was at least apologetic. Hopefully you'll get another chance to meet him. Thanks, R. Really, what I would like to do most of all is meet Jean-Claude Ellena, Olivia Giacobetti et al. Maybe one day. . .and hopefully they'll honour their appointments a little better than Monsieur Malle! I’ve been sampling some of the FM line recently, and am wearing En Passant today. I’m rather suspicious of pretty florals, as I find most of them boring and linear on my skin. The only florals I’ve enjoyed wearing have been from the OJ line (Ta’if, Frangipani and Champaca). But En Passant has enough unusual twists and turns to keep me intrigued, and the dry down is pleasant. My friend is searching for The Wedding Scent, and this is one I suggested to her (alongside all the OJ florals!!) She is very enamoured with it!! But the wheat and cucumber perhaps render the scent a little too ‘street’ for a full church wedding!! But lilac is a very fresh, innocent and dreamy floral so we are in search for more ‘wedding suitable’ lilacs, so if you have any suggestions……. Lilacs are hard to find in general, wedding or not. Ineke’s After My Own Heart is worth a shot. And perfectly named for a wedding, I guess! Also, as another aside, there are no reviews on this site for Noir Epices, Musc Ravageur and French Lover. Have you tried them Robin? If you have time for a quick feedback, I’d be interested to hear your views. They were the ones suggested for me by the FM online questionnaire!! I have tried them, but don’t love any of those 3 — I guess that’s why I haven’t reviewed them. MR & NE especially, though, have tons of fans, so you should try them, of course! I bought a bottle yesterday. The little sample I had was empty, and the craving for more got too strong. This really is “Spring in a bottle”! So true, I should dig mine out because I could use some spring right now! En Passant is truly gorgeous in its simplicity, I own a bottle as it screams spring. 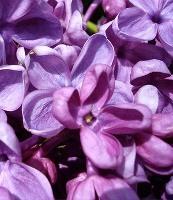 It is definitely a soliflore and very obviously lilac, truly stunning and real but also earthy. I do not smell too many other notes than lilac, a somewhat animalic lilac, like a lilac flower dug out of the Earth after the rain. Beautiful. There is one reason why I will not buy it again, it is very modest with very poor lasting power and sillage. But I will always keep some in my bottle to sniff it and spray a bit during a rainy or sparkly day in April or May.